It was like that dream—you know, the one where you find a penny on the sidewalk, stoop down to pick it up, and discover that there are hundreds more of them. Maybe that’s the kind of thing those born in humble circumstances dream of, but we all recognize the draw of a windfall. People are pretty tight with their money in Manhattan, but it was early in the morning, still dark, and rainy when I saw it. A hundred dollar bill on the ground. Then I noticed more—a while bunch of them. When I reached down to pick one up, it came apart in my hand. Of course, it was a novelty replica of an actual piece of currency. When I walk through the garment district I often find great swatches of scrap cloth that have spilled out of designers’ trash bags. I’m tempted, I’ll confess, to pick them up and save them for future use. Nevertheless, this hundred dollar bill wasn’t what it appeared to be. Many things aren’t. Religions around the world are predicated on the fact that what seems to be real isn’t. Even long before The Matrix came along. The idea that what occurs in our heads—or to use more conventional religious language, our hearts or souls—is truly real automatically takes us a step away from material reality. It’s not to say that this soggy, pulpy piece of paper in my hand has no existence, but it simply isn’t what it pretends to be. On mornings when the fates are all synched just so, I’ll look out the window of the bus from the helix and see Manhattan laid out in front of me like a picture postcard. “It’s not real,” I whisper to myself. Unlike the tourist in awe during a first visit to the city, I actually mean it. This concrete, glass, and steel world is not real. I’d feel a bit exposed suggesting such a thing on this blog had I not the biggest names in world religions behind me. One thing that they all seem to agree upon is that reality isn’t just what we experience in this corporeal vehicle that we currently call home. Religion has been called the opium of the people. Marx wasn’t the first to suggest that the more needy among us were the driving force behind belief. Nevertheless, belief is present in all forms of thinking from extreme rationalism to naive acceptance of what your parents told you. The thing about religion is that it conscientiously advocates belief. It admits up front that it holds certain things to be true. One of those beliefs happens to be that things are not what they appear to be. Here in Manhattan we’re all so busy rushing around that who has the time to stop and think like that? I frequently walk past Holy Innocents church on my way to work. I may function, in this world, as an editor of biblical studies, but as I pass that edifice to a faith to which I don’t even belong, I feel the draw. Inside those doors—and I know this is true because I can sometimes hear the bells—a different reality awaits. 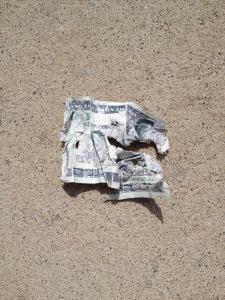 Out here there may be hundreds of dollars scattered on the ground. When you look closer, however, you discover that they’re not what they appear to be.